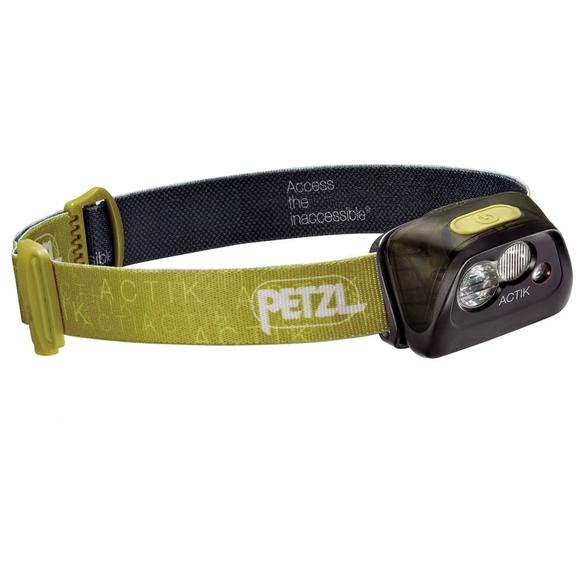 Petzl's ACTIK headlamp offers 300 lumen brightness. Featuring a mixed beam, it is ideal for outdoor activities like mountaineering, running, hiking and backpacking. Red lighting preserves night vision and prevents blinding other members of the group. Its reflective headband helps you to be seen when a light is shone on it, and is equipped with an emergency whistle for rescue situations. Petzl &apos;s ACTIK headlamp offers 300 lumen brightness. Featuring a mixed beam, it is ideal for outdoor activities like mountaineering, running, hiking and backpacking. Red lighting preserves night vision and prevents blinding other members of the group. Its reflective headband helps you to be seen when a light is shone on it, and is equipped with an emergency whistle for rescue situations. ACTIK is a HYBRID headlamp that is also compatible with the CORE rechargeable battery. Three AAA/LR03 batteries (included) or CORE rechargeable battery (available as accessory).